then complain about the shortage of cheap labor to pick fruit and prune trees. It is amazing to me that a company can plant thousands of acres of fruit trees in the middle of nowhere, then complain about the shortage of cheap labor to pick fruit and prune trees. What is even more amazing is that when this company is finally punished, to some small degree, for violating federal laws by hiring illegal immigrants or undocumented workers, people are rushing to support it. I am talking, of course, about Broetje Orchards being fined over $2 million for violating federal laws. Broetje Orchards has been hiring illegal workers for years, and making huge profits every year on its apple sales, yet some people, such as Susan Palmer, think it is all the fault of our government. We do not need immigration reform, we simply need to enforce the immigration laws that are on the books. But in this crazy world we live in today, those laws will never be enforced, and illegal immigrants will continue to pour across our borders until this country is transformed into something very different from what it used to be. Broetje Orchards needs to follow the law, hire legal workers, or be put out of business. 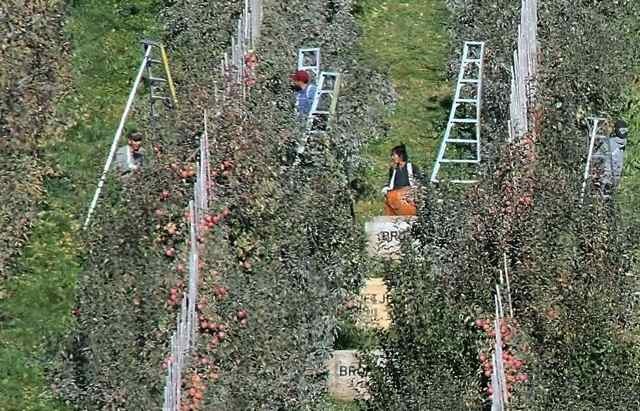 If the federal government was really serious about getting this country back in line, it would have fined Broetje Orchards $20 million, arrested those who are guilty of violating federal laws, and deport those workers who are here illegally. Broetje can more than afford to pay a $2.25 million fine because it is once again going to be left alone, for the next five or 10 years, to resume hiring illegal workers -- and bankrolling millions of dollars.